What if we didn’t have access to the electricity that most of us take for granted? Thanks in part to electrical linemen, we don’t have to, save for the occasional power outage due to stormy weather. Electrical linemen are America’s unsung heroes. They are the ones who install power lines and restore electricity in the aftermath of storms. Electrical linemen keep power flowing to the homes and businesses across the country. Being tasked with such an awesome responsibility requires a special set of traits. The lowest clearance for electrical power lines in residential areas is 10 feet in most places, which means the components on which electrical linemen work are up a little higher than that. 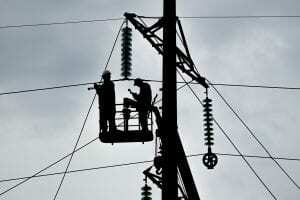 Transmission towers, on the other hand, range in height from about 50 feet to around 180 feet. Neither case is exactly a step onto your front porch. To be a successful electrical lineman, you need to be comfortable working high up for sometimes hours at a time. As with many other skilled trades and skills in general, there’s only so much textbook learning you can do in preparation before actually doing it. Working on high-voltage electrical power lines is no exception. Learning to string power lines from transmission towers to buildings, for example, is a skill that takes time and repetition that only hands-on learning can provide. Before taking to the poles, however, many linemen receive training in the form of an electrical trades program at a trade school or community college. With so much at stake, both for themselves and the people who rely on the electricity their labor provides, electrical power line workers have a lot to learn. And a lot to keep in mind while they’re high in the sky working on the lines. This requires a robust mental capacity and a knack for learning new skills. On top of superior mental fitness, electrical linemen need to be in good physical shape. Line work requires quite a bit of climbing electrical poles and transmission towers in order to service them. Athleticism is a valuable asset for electrical linemen to have, as it can make some of the rigorous physical aspects of line work easier. Electrical workers have a higher rate of death than individuals working in other professions. This is particularly true of line workers. Between the heights and the strength of the electrical currents, electrical linemen put their lives on the line each day they go to work. Safety procedures are of the utmost importance. Even still, working on electrical power lines requires an adrenaline-seeking personality, a willingness to live one’s life on the proverbial edge. Electrical power line installation and repair was ranked the 15th most dangerous job in America, according to a list from USA Today. The article mentions that 8.8 percent of the nonfatal injuries were a result of falling, which makes the comfort with heights we mentioned earlier all the more important. In order to do this job, you need to be comfortable putting safety on the line. Taking all of the other traits we’ve discussed into account, in addition to the inherent danger, electrical linemen need to be all in. Being focused on their careers is vital. Being passionate about one’s work is something most employers look for in employees, though it is particularly pronounced in an occupation such as electrical line work. If you’re not fully invested in the job emotionally, physically and mentally, mistakes are more likely to occur. A career-focused mindset can prevent injuries and fatalities in the electrical lineman field. As we’ve seen throughout the discussion of what it takes to be a successful electrical power line worker, there is a high degree of risk involved. Fortunately, the high degree of risk is met with high compensation. The median pay for electrical power line installers and repairers was $69,380 in May 2017, according to the Bureau of Labor Statistics (BLS). Paired with the fair compensation are plenty of career opportunities within an in-demand field. The BLS anticipates a 14 percent increase in the employment of power line installers and repairers by 2026. The best electrical linemen have a passion for lineman work. If you think you’re one of them, now is the perfect time to join the ranks of America’s unsung heroes. Enroll in an electrical trades program near you today. If you reside in the Chicago area, there is no better choice than Coyne College. Coyne College , one of Chicago’s finest trade schools, offers two programs for aspiring electrical workers: electrical construction and planning and electrical construction maintenance. Discover all that Coyne College has to offer and begin your journey to a new career today by visiting https://www.coynecollege.edu/.